When local councils pass measures out of concern for children’s safety, we don’t doubt that the concern is genuine. But when these measures restrict access to play opportunities, we have to wonder if they end up hurting, rather than protecting, children. While we’re big fans of playgrounds, we’re also big fans of street play. It utilizes existing communal space to bring neighborhood kids together in active, healthy ways. We recognize that street play can be dangerous, but why not pass an ordinance that targets inattentive, distracted, and speeding drivers, rather than playing children? If Woodland Park council were to take steps to ensure that adults pay attention behind the wheel and drive at reasonable speeds, children could safely share streets with cars—and everybody wins. Meanwhile, city councilors in Toronto have recently banned kites from Milliken Park. 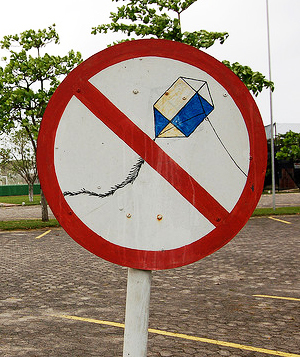 That’s right—no kites allowed. The sport of kite-fighting, popular amongst Toronto’s South Asian population, has apparently resulted in stray kite lines being left around the park, some of which are metallic or coated in glass. “People have called my office and said they’ve been cut by it,” city councilor Chin Lee reported to The Globe and Mail. Again, we take the safety concerns seriously, but banning a pastime that brings families and children together to enjoy the outdoors is ultimately counterproductive. Why not instead find ways to encourage kite flyers to clean up the strings, or to seek a compromise by limiting kite flying to certain areas of the park? A few months before Toronto erected “No Kite Flying” signs, the Walsall Council in the UK erected a “No Ball Games” sign—ironically just a few feet away from a sign reading “Broadway Playing Fields.” Citing land contamination as the primary concern, a statement issued by the council said, “The playing fields remain popular and a number of events are hosted there but unfortunately we have had to stop ball games taking place on the site for health and safety reasons,” according to The Telegraph. Wait, what? So kids are safe running around, as long as they’re not throwing balls? City councils are right to be concerned about children’s safety. We just hope they can find ways to protect children without denying them opportunities to get together outside and play.